View our white gold diamond rings here. If you're in the market for an elegant wedding or engagement ring, have you considered white gold diamond rings? White gold diamond rings make an excellent alternative to more traditional rings. Sure, diamond rings made with yellow gold are traditional, and platinum rings are all the rage; their biggest drawbacks, however, are their prices. While it's the diamond in a diamond ring that drives the cost of the ring, the metal in the band is also a factor. 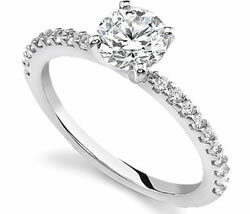 If your budget is a little tight or you'd just like to opt for a bigger diamond, don't forget white gold diamond rings. Not only are the prices right, the selection is large and varied. White gold diamond rings make excellent engagement and wedding rings, or you can simply buy one to reward yourself if you're feeling extravagant. White gold diamond rings have other characteristics besides price that make them chic and popular. One is the fact that people who are allergic to gold probably won't be allergic to white gold. The other elements alloyed with the yellow gold in white gold diamond rings -- chiefly palladium and silver, nowadays -- renders the gold less likely to cause an allergic reaction, if only by diluting it. Not only that, the allow makes white gold diamond rings much stronger than traditional yellow gold diamond rings. Gold is a soft, heavy metal; if it's purer than 14 karats, it becomes easily deformed. White gold, which was introduced in World War II as a replacement for platinum, doesn't scratch, bend, or erode as easily as pure gold, but it's still just as beautiful in its own way as the yellow kind. Modern white gold diamond rings are actually stronger than their platinum counterparts, and of course you can often get them for half the price. While white gold diamond rings are usually good mimics for platinum diamond rings, that's because of a bit of jeweler's art. White gold alloy more resembles gray steel than platinum, so it's plated with the shiny element rhodium to give it a white color and more flash. For this reason, the bands of white gold diamond rings often begin to show a slightly golden tinge after a few years of wear. While the coloration is not unpleasant-looking, you can visit a jeweler and have them electroplate more rhodium onto your ring if you want it to keep that silvery shine; in fact, it's recommended that you have your white gold diamond rings replated at 12-18 month intervals. Some jewelers (though sadly, not all) will replate white gold diamond rings free of charge. After all, you're talking about a layer of rhodium that's rarely over 20 atoms thick. That's a scale that would make the thickness of a human hair look as tall as the Sears Tower in Chicago. Then there are the older white gold diamond rings, which are made of a mixture of platinum and yellow gold. The result, ironically, is high-quality white gold that's stronger and shinier than regular white gold, is less likely to show a yellowish tinge, and is easier for a jeweler to work than pure platinum. Of course, you'd be giving up one of the chief advantages of modern white gold diamond rings -- that is, the discounted price -- but the cost would be less than that of a pure platinum diamond ring.